This post is pretty straightforward. 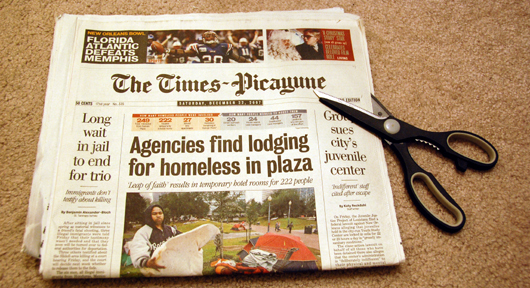 Copy editors often are charged with trimming large stories into smaller ones, sometimes considerably smaller ones. It's increasingly becoming a reality as our readers' attention spans shorten. I'll just present my notes in bullet points for any editor who wants to pick up a few tips. Make use of cutlines: Don't repeat the same information from the story. Let graphics and text boxes share the load: Again, this text shouldn't regurgitate the story. Cut carefully with the reader in mind. When a story is close to fitting, edit it thoroughly before trimming: Find words and phrases to cut. Trim excess details and quotes. Pull back lines if your publishing system allows it: Watch out for widows. When you have a lot to trim, remember the inverted pyramid. Read, but don't edit, the entire story. Look for optional trims in wire copy. Keep the explainer (why you should care about the story). Keep the "talker" (something you would tell a co-worker tomorrow at the water cooler). Keep the methods and disclaimers on scientific and poll stories. Keep the he said/she said (both sides of the story). Cut the excess, and summarize the essential. Make sure you keep the first reference of names. Don't end on a transition. Make sure the story ends somehow, not necessarily with a quote. Use just the facts: Leave out quotes. Use quotes only if they're effective at getting the story across. All of these elements require a short style, which often is achieved through trimming. When a car accident happens around 4:30 p.m., put the traffic information at top. Do this especially if people are injured. Later on, the lede might change to stress injuries or fatalities. Title: "Tighten Up! Trimming the Fat, Trimming to Fit"
Description: One of the underrates skills that a copy editor must have is the ability to trim: Cutting huge swaths, excising an unnecessary paragraph of two, posting parts of stories online first, even if the whole story is in. But trimming isn't just about fitting the story to the page. Just because there's unlimited space on the Web doesn't mean readers wants 1,600 words. This session will cover trimming for both situations: fitting stories into a print publication and streamlining for the Web.